`submit` in a `set` element to the control server. Note that it is allowed to send only a partial form back to the control server. If the device is divided into nodes, both the `getForm` and the `set` elements can include node definitions to specify which nodes are implied. probably due to restrictions based on the sender identity. 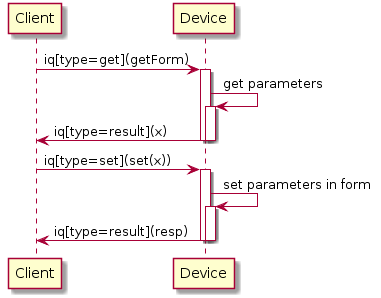 If the device denies all control operations, an error is returned instead of a partial result.